I prepared stock using Bouillon powder. It is avaiable in stores with both vegetable and non veg flavour. I used Vegetable flavour. Take one tablespoon powder and dilute in three cups of water with out lumps. Our vegetable stock is ready . Heat Oilve oil(2 tbspn) in a heavy bottom pan. Saute celery stick and spring onion till it become transulent. Cool it and put it in blender. Add lemonjuice,honey,Olive oil,vegetable stock and salt with celery mixture. Blend it well and keep it in low flame for 5 minutes. Sprinkle some spring onions on the top of soup. Yummy soup is ready and serve hot. 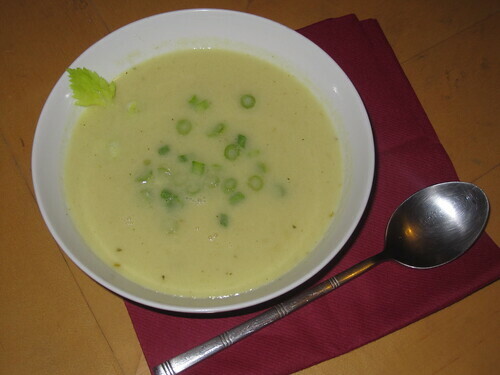 The Celery soup can be served with fresh cream on top. I avoided that due to diet reason. It can be served for dinner as starters with salt and pepper. I am sending this soup to A.W.E.D.BRITISH Event hosted by Reva's Kaarasaaram which is originated by Dk's Chef In You. 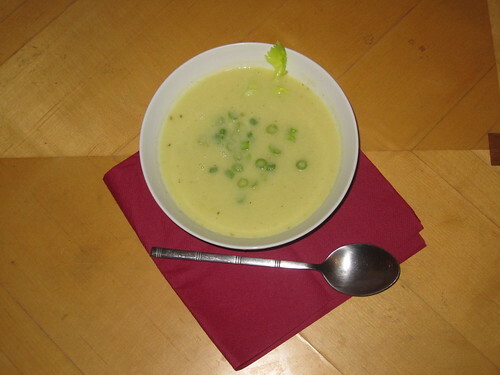 I am also sending this soup recipe to Divya's Show Me Your Soup Event. A lovely comfort bowl of soup, looks so yummy. Love the creamy and yummy delicious soup. That;s really a comforting bowl of soup..nothing tastes better than a hot bowl of soup on a rainy day. Celery soup is new to me... Thanks for sending it to the event, dear.. Your delicious bowl of soup is making me really hungry :)..nice color n texture!! Ila, soups are my all time comfort food... Love the creamy texture..